Most bee flies (Family Bombyliidae) are parasites. They feed externally on the larvae of bees and wasps, consuming the host when it is in a ‘quiescent stage such as the mature larva, prepupa or pupa’ (1). Some are even hyperparasites, which means that – in the larval stage – they feed on other parasites, themselves feeding on the larval stage of another insect. The adults generally feed on nectar and pollen and may play an important role as pollinators. I have come across this fly a number of times in northern Thailand, when trying to take photographs of butterflies. It is quite large (well over 1 cm in length) and commonly rests on the ground, often near water. I am fairly sure that it is Ligyra tantalus Fabricius, 1794, which has a very wide distribution, including China, Taiwan, India, Malaya, the Philippines and Thailand. There is a reference in an Indonesia text to Ligyra tantalus being a parasite of wasp larvae of a Campsomeris sp., which are large Scoliid wasps (2). This suggests that it might be a hyperparasite, since another Ligyra bee fly species, Ligyra satyrus, larvae are found inside cocoons of a scoliid wasp, Campsomeris tasmaniensis Saussure, which are external parasites of canegrubs (Coleoptera: Scarabaeidae) (3). So if it is a hyperparasite like L. satyrus, L. tantalus would be classed as a pest, if it were feeding on the natural enemies of a plant pest! This photograph was taken in February in Doi Sutep-Pui NP, Chiang Mai, Thailand. 1) Yeates, David K., and David Greathead. “The evolutionary pattern of host use in the Bombyliidae (Diptera): a diverse family of parasitoid flies.” Biological Journal of the Linnean Society 60.2 (1997): 149-185. 3) Yeates, David K., David P. Logan, and Christine Lambkin. 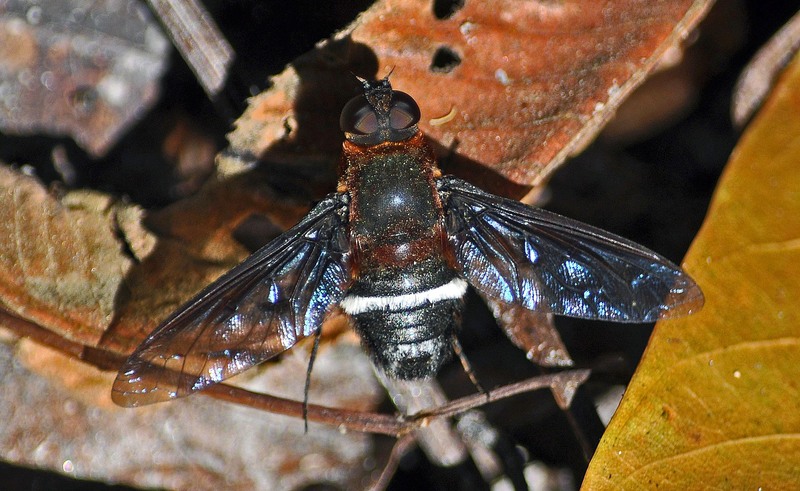 “Immature stages of the bee fly Ligyra satyrus (F.)(Diptera: Bombyliidae): a hyperparasitoid of canegrubs (Coleoptera: Scarabaeidae).” Australian journal of entomology38.4 (1999): 300-304.